Robert James-Collier (born 23 September 1976) is a British actor and model. He is known for his roles as Thomas Barrow in Downton Abbey and as Liam Connor in Coronation Street. 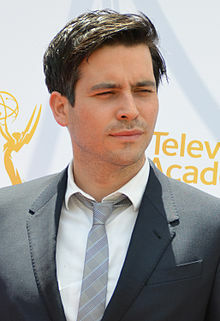 James-Collier was born in Salford, Greater Manchester, as Robert Collier, but changed his name to Robert James-Collier to comply with the rules of Equity. He was educated at St Patrick's Roman Catholic High School in Eccles, Greater Manchester. James-Collier has two degrees; he studied business at the University of Huddersfield and marketing at the University of Manchester Institute of Science and Technology. Having no experience as an actor, James-Collier auditioned for the series Down to Earth. Stars Ricky Tomlinson and Denise Welch were convinced by his talent, and he got the part of the womanising pub landlord. In 2006 he appeared in New Street Law and played a small part as Stud in Shameless series 3, episode 5 under the name of Rob Collier. In 2006 he joined Coronation Street as one of the brothers buying a share of the local underwear factory. He left the show in October 2008. In an interview in early 2008, James-Collier announced he was leaving the soap but was planning to come back in the future. However, in June 2008, it was reported that the character of Liam was set to be 'brutally' killed off in the soap as part of a murder-mystery plotline where three well known residents would fall under suspicion for the crime. One of these would be Tony Gordon played by Gray O'Brien, who was in a relationship with Carla Connor played by Alison King in the show. After leaving Coronation Street, James-Collier had a leading role as under butler (formerly first footman) Thomas Barrow in Downton Abbey, from 2010 to 2015, and has appeared in the West End stage version of Calendar Girls. James-Collier played Kevin O'Dowd in ITV's 2016 crime drama, The Level. In 2017, James-Collier starred in British horror film, The Ritual, in which The Guardian described his performance as "a fierce screen presence". He will also play a small role in Jessica Hynes directorial debut, The Fight. In 2019, it was announced that James-Collier had been cast in the third series of Channel 4 school-drama Ackley Bridge. He will be portraying the role of Martin Evershed, a new deputy head. James-Collier modelled for Argos, where he appeared in the Autumn/Winter 2007 and Spring/Summer 2008 catalogues. He won the Sexiest Male award at the 2007 and 2008 British Soap Awards in addition to "Best Exit" at the 2009 British Soap Awards. He won Sexiest Male and Best Newcomer at the 2007 Inside Soap Awards. James-Collier and Lauren Chandiram have a son who was born in 2010. ^ "Rob James-Collier". bebo. Archived from the original on 23 October 2012. Retrieved 21 February 2011. ^ "Liam, how can we Corrie on?". The Sun. 17 October 2008. Retrieved 21 February 2011. ^ Green, Kris (3 February 2008). "'Liam' quits Corrie over "typecast" fears". digital spy. Retrieved 21 February 2011. ^ "Rob James-Collier works hard for Downton". FemaleFirst. 27 September 2010. Retrieved 21 February 2011. ^ "Rob James-Collier on life in Downton Abbey as Thomas Barrow". Lancashire Life. Retrieved 12 January 2015. ^ men Administrator (19 February 2007). "Unknown Rob flies the Co-op". men. Retrieved 12 January 2015. ^ "Corrie's latest bad boy". Manchester Evening News. 17 April 2010. ^ a b Lockyer, Daphne (13 March 2012). "Rob James Collier steps out from Downton Abbey". Daily Express. Retrieved 12 January 2015. ^ "School goes to top of class". Manchester Evening News. 18 April 2010. ^ "Up stairs down". The Northern Echo. 23 September 2010. Archived from the original on 26 September 2010. Retrieved 24 September 2010. ^ "Ackley Bridge series three casts Corrie and Downton star Rob James-Collier". Metro. 16 January 2019. Retrieved 16 January 2019. ^ "Corrie's hunk Liam's real-life fiancee looks like on-screen loves". Mirror. 21 February 2012. Retrieved 21 October 2015. ^ "Nancy - Short Film 2019". youtu.be. Retrieved 14 March 2019. This page was last edited on 9 April 2019, at 11:53 (UTC).